"At Bastion we turn email marketing into an effective and appreciated customer touch tool." "Always stay top-of-mind with your customers and prospects because your competitors are just a click away." Using an email touch marketing program to regularly communicate with your customers and top prospects is an excellent way to keep your name in front of them. At Bastion Internet we try not to reinvent the wheel. There are already a number of quality Email Service Providers providing both efficient and cost effective systems (e.g. 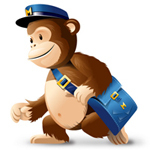 MailChimp, Constant Contact, Vertical Response, etc.). What Bastion brings to the table is an expertise in helping you plan, implement, and continually deliver the program. There are multiple components needed to effectively start and run your email campaigns. The first is design. We recommend a custom designed email template to match your website vs. using an out-of-the-box template supplied by your email service provider. Bastion's Design Division can assist you with producing high a high quality email template and variations. Typical costs are in the $400 - $1,000 range. Other setup components include establishing your contact list and integrating sign-ups with your website. Costs here range from $0 to a few hundred dollars. Our first step with you is to spend some time developing your email marketing strategy including the objectives, frequency, and integration with your other web properties (e.g. website, social sites, etc.). Next, we'll help you select the best email service provider and assist you in setting up your account, including design and your initial database of prospects and customers. Finally, we'll get you started sending out emails. We can assist you on a regular basis (formatting and sending out all of your emails), or simply from time to time as you need it. Once you're set up, activity involves producing your regular emails and managing the system. Typical costs range from $50-$100 per email.